To sum up: It used to be that the safest place to keep a secret was inside your own head. Now, Leonardo DiCaprio plays a professional thief who can enter people's dreams and extract any information from them. Is there no place safe!? Find out in this summer's smartest action picture from the mind of Christopher Nolan. Good things come to those who wait. In my case, after a long summer, I get to enjoy one of the most unique psychological thrillers I’ve seen in a long time. For writer/director Christopher Nolan, it’s the cinematic fulfillment of an idea whose inception began over nine years ago, back in the pre-Batman days of Memento, the film whose protagonist had short term memory and told its story backwards. Like that film, Inception plays with the mind and the delightful potentials of perceived realities, taking the audience on a winding journey through the subconscious, where one is never certain what is going to happen. Leonardo DiCaprio plays Dom Cobb, a shell of a man haunted by his past and a guilt that is eating him alive; a man with legal troubles that disallows his return to his home in the U.S. or, most importantly, his two children. Cobb, whose specialty is the ability to enter people’s dreams and extract information from their very subconscious, is the ultimate corporate thief. While engaged in an attempted theft inside the mind of Saito (Ken Watanabe), Cobb runs into trouble in the form of a mysterious woman named Mal (Marion Cotillard) who interferes with the operation and alerts Saito to the situation and foiling the theft. But even with this apparent failure, Cobb's abilities impress Saito enough that he wants to hire him for a special mission; a mission not of extraction but implantation; a concept called inception. Saito wants Cobb to implant an idea into the head of a business rival, Robert Fischer (Cillian Murphy), who is about to inherit the corporation from his father; an idea that will cause Robert to dismantle his business empire, leaving the market open for Saito to take over. But what Saito is asking for is impossible. The only way for a person to be receptive to an idea is for them to come up with it on their own. Attempt any kind of mental manipulation like that and they will very quickly discover the truth. But Cobb thinks he can do it. More importantly, he must; for the payoff is Cobb regaining the ability to return home and be reunited with his two children. Assembling a team of experts including Arthur (Joseph Gorden-Levitt) his most experienced partner, Eames (Tom Hardy) a proficient rival who has the ability to appear as anyone in the dream environment, and Yusuf (Dileep Rao) the chemist who induces people into the dreams, Cobb sets out to attempt the impossible. But he also needs someone who can construct the dreamscape that Fischer will be taken through. For this, he recruits a young student named Ariadne (Ellen Page), whose mind is so proficient that she can construct mazelike worlds that come from the school of M.C. Escher, essential for keeping the dreamer in unfamiliar surroundings. For if the dreamer is someplace familiar and the details are not just right, they can discover the truth and all the effort will be for naught (which, for me, doesn't quite make sense, because my dreams approach nowhere near a normal world, let alone normal surroundings). Rounding out the group is Saito himself, who is there to ensure that everything goes according to plan. With this setup, Nolan is free to take the audience on an adventure through the subconscious that literally bends the three dimensions. And because it's a dream world, created in the subconscious by the designer, the surroundings can be anything and manipulated in any way, which enables the film to create some originally clever environments. But the danger is that if the person who is dreaming discovers that he's dreaming, he can subconsciously fight back, projecting from his subconscious armed guards, for example, to protect him, which enables the film to create some originally surreal environments. And on top of that, because the dreamer's body still inhabits the real world, anything that affects the sleeping body, such as the balance orientation from falling (the inner ear), will manifest itself upon that dream world, which enables the film to create some originally psychedelic environments. In short, with floating bodies, twisting cityscapes, and real honest to goodness Dream Warriors, Inception is one of the most visually engaging and exciting films I've seen in a long time; though comparisons to The Matrix and James Bond films may be inevitable. Of course, the goal isn't to play scientist. Nolan is not going for an accurate representation of how the subconscious works in the dream state, no more than Wes Craven was in Nightmare on Elm Street. The goal of the film is to be realistic and consistent enough within the parameters that it establishes, so that it achieves the suspension of disbelief, and the audience allows itself to be drawn in. And so, there's just enough explanation of the subconscious dream state, usually within ten minutes of a question being raised (how convenient! ), that the audience will play along and Nolan can get on with telling the very exciting story that he wants to tell. If you want to delve deeper into the accuracies of the subconscious, consult your local psychiatrist. Besides, where's the fun in films if we followed with 100% accuracy the scientific laws? Would sound travel though space in Star Wars? Would the vampires in Twilight sparkle? Could Armageddon be an even better movie if it followed the laws of physics? Nah, nothing can make that film good. Demonstrating why he is one of the best young actors working today, Leonardo DiCaprio again provides a solid performance in his portrayal of the scarred Cobb. Cobb, with his skill and professionalism, is uniquely suited to pull off a job this complex. But with his haunted past and emotional baggage, Cobb is also uniquely suited to blow the job and destroy not just himself, but those around him. Thankfully, Cobb is written so that he doesn't wallow in a world of self pity and doubt. This is, in part, due to the film's nature, which is primarily a heist thriller. As a result DiCaprio balances his damaged past nicely with his job at hand, trying to achieve the goal of giving his life a future while remaining thoroughly bound in the past which may consume him. And this lends itself to a second flaw; that the character of Ariadne is underwritten. She is the one with whom Cobb confides the most in. She is the one who accompanies him on his emotional journey as it reaches its conclusion. So, even though the film is not about her, it is clear that she is the major secondary character. The problem is that there is no development of her character as a person. We know nothing about her; her background, her interests, her motivations. Who is Ariadne? An example of this type of character could be Louise from Casablanca. Though, he was not the main focus of the film, he was still developed to the point that we still learned about his greed, his charming corruption, and that buried patriotism. He became a real person with levels of depth. In the same way, Ellen’s Ariadne should have become more than a blank slate. Instead, her character exists as a sounding board. However, given what she is there to do and the journey that she shares with DiCaprio, I will say that her performance was spot on. Though, at first, I was distracted by how young she looked, her skill as an actress infused her character with a grounded professional maturity, enabling me to quickly forget that minor distraction. It could be said that the characters exist on a primary level. Watanabe plays the money; the shady character who is funding the operation. Can he be trusted or not? Hardy is the unknown outsider who is brought in because of his needed expertise. With his abrasive, self serving attitude, is he only out for his own needs? Gorden-Levitt is the old friend, trusting in Cobb's abilities and willing to overlook his emotional issues. Murphy plays the victim, the person against whom the heist is committed. What is interesting is that as the unappreciated and unloved son of his father, Murphy's Fischer is actually more fleshed out than some of the other characters in the film, plus the fact that for once, he's not playing a creepy bad guy (What made him so creepy as Dr. Crane in Batman Begins? The Sarah Palin glasses). Page is the everywoman, the person in the story that represents the audience's point of view; brought in to ask the questions so that the audience can understand the plot. In other words, they are the necessary types that the heist film usually employs. This is not a film about relationships, and save for Cobb's story, no time is spent developing them. But that is also not the point of the film. 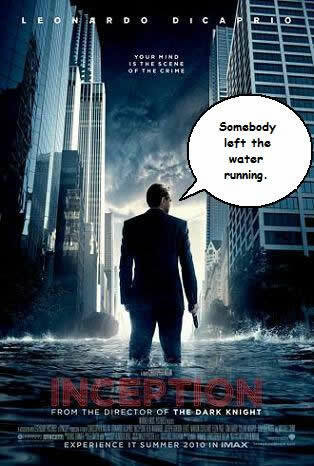 What makes Inception so successful is that in spite of what it is at its core, the film manages to rise above its basic necessities and become a thoroughly engrossing thriller; creating characters, who, while not always fully fleshed out, are certainly believable and come across as real people that you will care about. In other words, with a story and visuals that are so unique, I'm picking some really small nits. Stories are supposed to propel you, let you experience the excitement and drama that the characters are going through. They should engage you and if you're lucky, make you think. Inception succeeded in all of that. It trusted its own complexity and did not once pander to the audience. Oh, if Hollywood would do this more often! As if drifting into sleep, the theater and the concerns of my life faded and I was easily carried into Inception's dream world, propelled along for 2½ hours on a unique adventure. And I was lucky enough to have something worth thinking about afterward. I have finally watched the first film of the summer that I'd actually pay to see a second time in the theater.